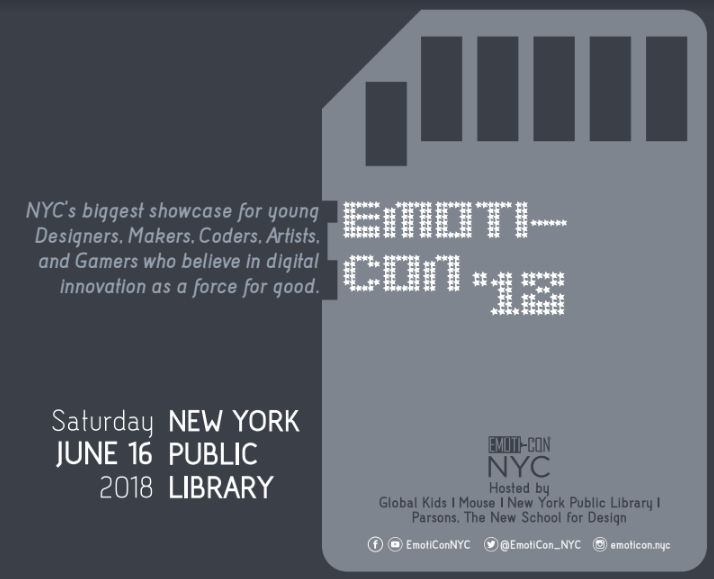 NEW YORK CITY, June 4, 2018— On Saturday, June 16th, youth from across New York City will connect, compete, and present their technology projects at Emoti-Con, held in the Celeste Bartos Forum in The New York Public Library. Celebrating its 10th year, Emoti-Con is New York City’s biggest showcase for young designers, makers, technologists, and digital artists who believe in innovation as a tool for positive change in the world around them. Through this annual event, Emoti-Con brings together diverse middle and high school students to collaborate with their peers, connect with those with whom they share a common identity as youth media producers and technologists, and receive recognition for the incredible work they do throughout the year. Emoti-Con is the largest event of its kind among informal learning programs in NYC and has been developed through a unique collaboration between NYC youth-serving organizations. This year’s organizers include Global Kids, Mouse, The New York Public Library and Parsons School of Design. For the first time, students and educators participating in the NYC Department of Education CS4All program will participate in Emoti-Con, showcasing projects they have created, including robotics, web, and game design. Dr. Amon Millner, Assistant Professor of Computing and Innovation directing the Extending Access to STEM Empowerment (EASE) Lab at Olin College. He develops technology and community platforms to facilitate learners becoming empowered to make and make a difference in their neighborhoods. Nafiza Akter, Educational Technology Specialist working in the Provost's Office at Teachers College, Columbia University. Nafiza partners closely with faculty to design or redesign programming for online learners. Prior to joining Columbia, she served as an Instructional Designer at the New Jersey Institute of Technology. More than 40 entrepreneurs, developers, designers, makers, educators, engineers will share their career paths and serve as judges for our teen projects. Judges will select projects from the Emoti-Con Challenge to be recognized as: Most Innovative, Most Potential for Social Impact, Point of View, Most Entertaining, and Best Pitch. Youth attendees will select the Crowd Favorite. BNY Mellon, Capital One, and Con Edison are generously sponsoring this event, with In-Kind support from Blick and Glitch. Emoti-Con ensures that young people in NYC can offer their voice about pressing issues, gain vital exposure to industry mentors, and most importantly, be part of a community that will be instrumental in helping solve the challenges of their time. Global Kids, Inc. is the premier nonprofit educational organization for global learning and youth development that works to ensure that youth from underserved areas in NYC and DC have the knowledge, skills, experiences and values they need to succeed in school, participate effectively in the democratic process, and achieve leadership in their communities and in the world. Learn more at www.globalkids.org. Mouse is a national youth development nonproﬁt that believes in technology as a force for good. Mouse empowers all youth to create with technology to solve real problems and make meaningful change in our world. We are committed to creating more diversity in STEM and opening opportunity for students from underserved communities across the country. Founded in 1997, Mouse programs have had a positive and lasting impact on more than 50,000 youth nationwide. Learn more at mouse.org. The Computer Science for All (CS4All) initiative will ensure all NYC public school students learn computer science, with an emphasis on female, black, and Latino students. Through CS4All, students will be better prepared to utilize CS during their K-12 experience and after graduation. CS4All is a public-private partnership with New York City supported by a range of foundations, corporations, nonprofits, families, and individuals. Learn more at cs4all.nyc. The New York Public Library is a free provider of education and information for the people of New York and beyond. With 92 locations—including research and branch libraries—throughout the Bronx, Manhattan, and Staten Island, the Library offers free materials, computer access, classes, exhibitions, programming and more to everyone from toddlers to scholars, and has seen record numbers of attendance and circulation in recent years. The New York Public Library serves more than 18 million patrons who come through its doors annually and millions more around the globe who use its resources at www.nypl.org. < No Such Thing, Episode 31: "Break All The Rules"